Every week, Business Jazz explores how to be Genuinely Attractive In Business Today (GAIBT). Thank you for dropping by. It means a lot to us and we appreciate your time. The story of this podcast is the story of a group of friends and allies spread around the world. We’ve never all been in the same room together, and no more than two of us have met face-to-face at any given time. Serendipity and the internet have brought us together. 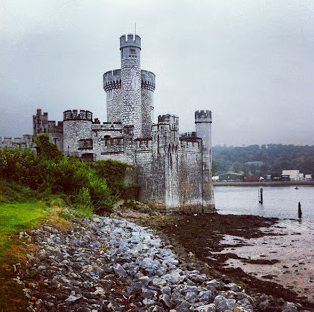 Business Jazz podcast began when we (Paul O’Mahony and Roger Overall) began recording weekly conversations at the cafe inside the Blackrock Castle Observatory in Cork, Ireland. We are friends, neighbours & collaborators. At the heart of our discussions was the weekly subscription email written by Chris Brogan. Boston-based, Chris wanted to help “professionals work better, do the work they want, and to be brave”. The kind of man Chris is? This podcast was thrust upon him. He didn’t ask for it. Nor was he consulted about it. He wasn’t even warned. It grew out of Paul & Roger walking dogs & meeting for coffee. Chris Brogan embraced it with warmth and support. Mark Cotton, based in England, appeared one day in the circle. Mark offered the help of an audio wrangler, a producer even. He moulded the sounds into a disciplined soundtrack. He wrote the music. His band is Just Fontaine. His partner Sarah Langton provided the gentle introduction, drawing you in. AJ Leon was drawn into this circle too. We didn’t ask for permission to riff off his newsletter. We knew AJ wouldn’t mind. 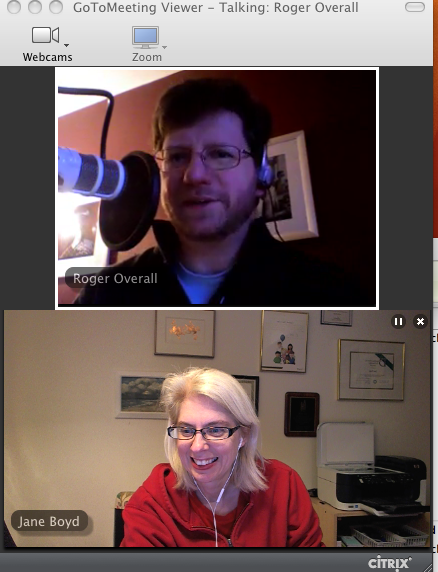 Jane Boyd in Canada and Roger in Ireland recording an episode of season 2. Jane Boyd got to know Paul and Roger thanks to this Audioboo (by Paul). Jane saw the potential for discussion and took on the role of cheerleader & backbone. Jane also became co-host of Business Jazz for Season 2. This allowed Paul to step back from recording for a while. You might be wondering where are seasons 1 and 2 are. When season 2 ended, the outlook for the podcast was bleak. Life kicked Paul & Roger about quite a bit. Roger let the subscription to the hosting service lapse and the episodes fell into the interabyss, seemingly lost forever. But the recordings do still exist on the servers of Show & Tell Communications. We plan to re-release them in the course of 2018. The focus of this podcast has expanded way beyond Chris Brogan’s weekly email. But his ideas & teachings remain at the heart of the podcast. Every week, Business Jazz explores how to be genuinely attractive in business today. Nothing would ever have happened without James Macolgan. Before the coffee meetings, before Chris’s emails and Jane’s encouragement, there were the Audioboo recordings of conversations made by Paul & Roger while they walked their dogs together. The chats twisted, turned, peeled off, then came back again, meandered. James listened from Scotland, enjoying the dynamic. He was the first to suggest a formal podcast. He was the genesis. He is “Listener #1”. Someone who did actively attach to the Business Jazz band was David Bailey. David, who lives in Bosnia, contacted us about placing Business Jazz in a regular slot on Belgrade Life – an internet-based radio station. We love being associated with such a city – a city in which Roger once doused a man with a machine gun with mineral water by accident. And still we haven’t talked about the most important people associated with this podcast. The gift of your ears and your time is gratefully received. No podcast survives without listeners. And no podcast thrives without listeners getting involved. If you have something to say, let us know. This is a two-way street. The traffic in our lane is pretty heavy already. We can’t wait to see what you do with your side of the road.